New York, NY, June 27, 2008 — Aitzaz Ahsan, President of the Supreme Court Bar Association of Pakistan and the leader of the “Lawyers’ Movement” in that country, will speak at the New York City Bar on Tuesday, July 1st, 2008, at 9:00 a.m. Mr. Ahsan will discuss the latest developments regarding the legal system and judicial independence in Pakistan. 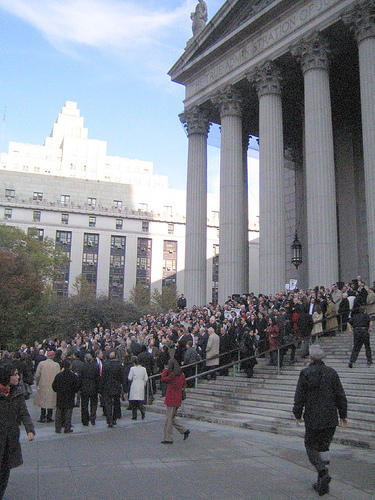 Last November, members of the New York City Bar, along with the New York State Bar, the New York County Lawyers’ Association and other organizations, rallied in support of the lawyers and judges affected by the imposition of emergency rule in Pakistan and the deposing of Chief Justice Iftikhar Muhammad Chaudhry. Mr. Ahsan will provide an update on efforts to achieve, as he phrased it in a recent article in Newsweek, “Justice for our Justice,” and the reinstatement of other members of the judiciary. “We have been very supportive of the efforts of Pakistan’s legal community to promote judicial independence and the rule of law, and are delighted that Mr. Ahsan is here to inform the New York City Bar of the progress on those fronts,” said Patricia M. Hynes, President of the New York City Bar. The New York City Bar Association (www.nycbar.org) was founded in 1870, and since then has been dedicated to maintaining the high ethical standards of the profession, promoting reform of the law, and providing service to the profession and the public. The Association continues to work for political, legal and social reform, while implementing innovative means to help the disadvantaged. Protecting the public’s welfare remains one of the Association’s highest priorities.